The Smart Era is predicted to revolutionise the compressed air industry, thanks to a rise in new technology that will drive faster response times, reduce service requirements and promote a more efficient use of energy. Glaston Compressor Services examines how the Smart Era will improve air compressor management and what tools on the market are already driving this change. According to a recent article published on Plant & Works Engineering, the compressed air industry is looking ahead to a smart future. Technology has advanced in accordance with a growing push for businesses to be more efficient in the way they manage their compressed air supply and the cost-effectiveness of their processes. But it is not just cost-effectiveness that will be improved through smarter technology. According to Michael Douglas, Managing Director at Glaston Compressor Services, faster response times will be driven by intelligent system intervention, or a combination of human and artificial influences. He believes that a routine service could soon be undertaken remotely, reducing call-out times and admin time. “It won’t be long before the compressed air industry investigates how innovative 3D and 4D remote visualisation software, which is already out there, can be used to benefit the industry,” says Michael. One piece of equipment already light-years ahead in terms of compressor management is the KAESER Sam 4.0 air compressor controller. This intelligent controller is the mastermind of the KAESER Sigma network and uses unique algorithms to power the whole air compressor system to its best capacity. KAESER says of the innovative tool: “Compressed air is one of the biggest utility costs. Too often, compressors in multi-unit systems operate on their individual control signals and are not well integrated. Much energy is wasted by running more machines than necessary and at higher pressures than needed. Other problems include fluctuating pressure, as well as increased maintenance and repair costs due to excessive valve cycling and motor starts. How does SAM controller improve air compressor energy management? The SAM controller from Kaeser uses numerous features to help businesses run a more cost-effective compressed air supply. The main being advanced algorithms that adjust the compressed air supply in accordance with the most effective and efficient outcome. 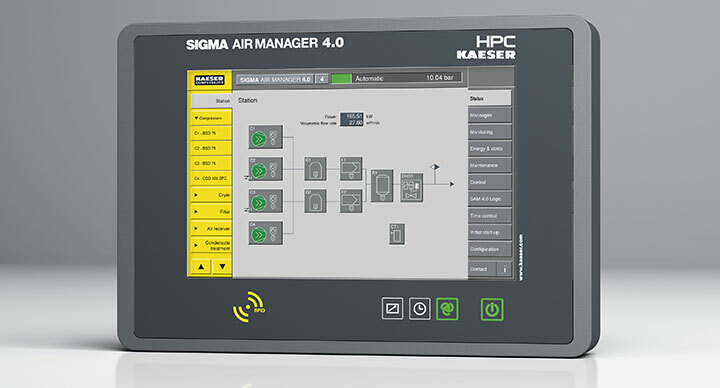 The SAM Kaeser air compressor controller forms the heart of the Sigma Network. Its key technology works in conjunction with the advanced world of the Industrial Internet of Things (IIoT) and Industry 4.0. When used as part of your compressed air system, the SAM controller manages every aspect of your compressed air supply. If you’d like more information about the KAESER SAM controller and how it could improve your compressed air system, contact a Glaston engineer today on 01695 51010.